……and it weighs 19 pounds. Now THIS is settled science ! A new Israeli silent “Ghost” UAV, designed to haunt terrorists and operate in urban areas both day and night, was unveiled at the Latrun Conference this week, near Jerusalem. 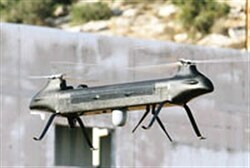 The Israel Aerospace Industries (IAI) said its Ghost weighs only 19 pounds and provides real-time intelligence to ground forces operating in urban areas. It is equipped with an automatic vertical takeoff and landing system and can loiter for up to 30 minutes silently, thanks to twin rotary electrical engines. The Ghost’s interface and operational concept is based on the principles of computer games and makes the system extremely intuitive to operate and requires little training, IAI said. The entire system can be carried in backpacks by two soldiers. Also unveiled at the conference was the new Othello Optical Hostile Fire Source Locator system, weighing 22 pounds and operable by only one soldier. It can be mounted on top of light tactical armored vehicles, infantry fighting vehicles and airborne platforms and precisely locates the sources of hostile fire, including antitank guided missiles, rocket-propelled grenades (RPGs), artillery and gunfire. Another Israeli innovation at the conference is an electric-powered, tethered airborne platform for observation and other applications, which can be deployed from a static or moving ground vehicle or station up to an altitude of 100 meters. This gear is all well and good, one heck of an advancement in and use of technology and will undoubtedly save IDF lives, but it’s all too cutesy. Right now, we don’t need cute and/or all that much in the way of high tech gizmos. A rocket comes over the border from Gaza ?…… Follow the smoke trail back and level the square mile where it’s centered. The Quranimals start that day of rage nonsense again and cross borders like they did before ?…… A few strategically located Dillon M134’s will take care of the ‘misplaced travelers’. Those are just two ‘subtle hints’ available to give the peace lovers, who understand only two things: Power and force. This entry was posted on Wednesday, September 7th, 2011 at 05:59 and is filed under Main Postings. You can follow any responses to this entry through the RSS 2.0 feed. You can leave a response, or trackback from your own site.